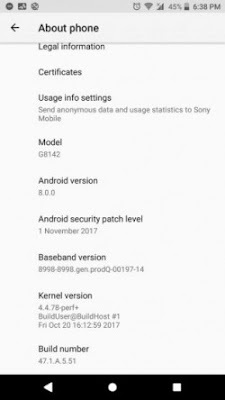 Sony Mobile release a new firmware update for the Xperia XZ Premium , moving it from build number 47.1.A.3.254 to version 47.1.A.5.51. This update includes a fix for the camera sensor issues that owners of the dual-SIM version were encountering, where the RGBC-IR and ToF (Laser AutoFocus) sensors were not working as they should. The new firmware also includes the latest 1 November 2017 Android security patch. The new firmware is currently live across a number of regions, you might want to check if you have this update ready for your phone.